As you know, the configurable product is a favorite kind of product in Magento 2. 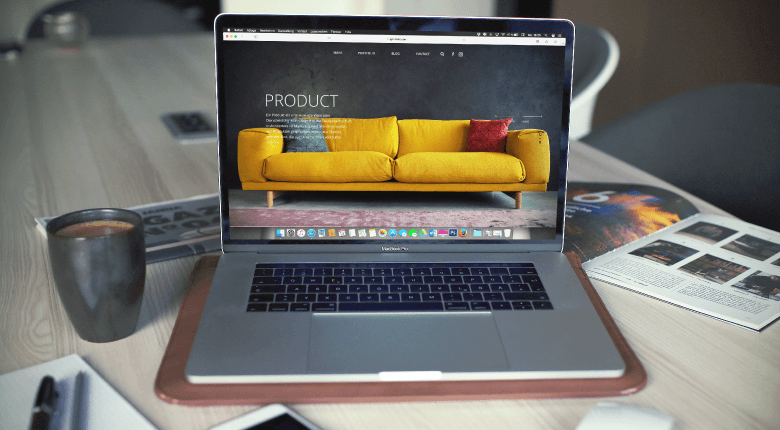 However, the display of configurable products in the frontend of the Magento 2 site still has several drawbacks, so in this blog, we will share about these cons and offer solutions for these. First of all, the Magento default provides selecting option display for configurable products which makes customers inconveniently order products and review. 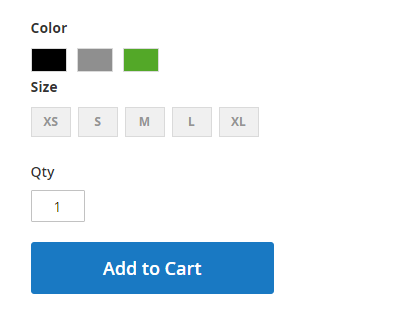 Customers have to choose each custom option and quantity per child product before adding to cart, so they cannot add multiple simple products to the shopping cart at one if they want a large number of products. Secondly, the default configurable product only allows showing SKU and availability of configurable products, not children products. 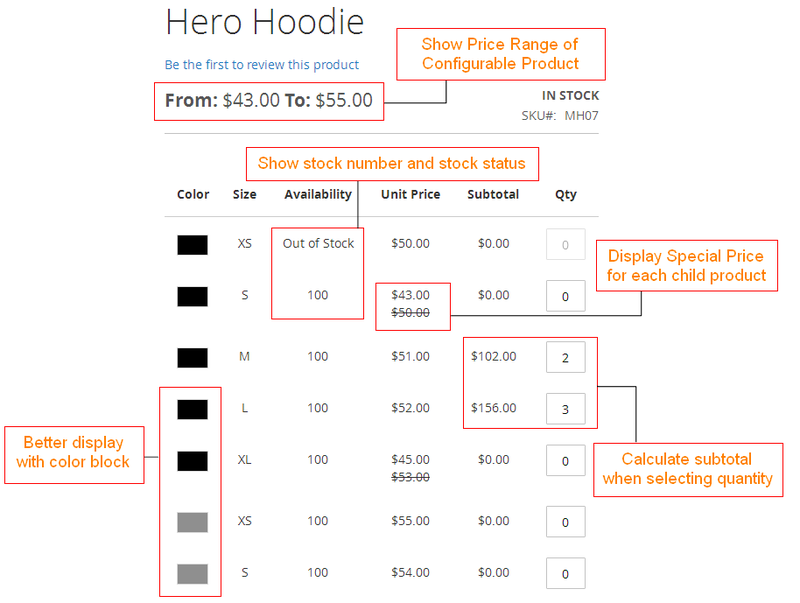 As you can see in the picture below, stock status and SKU belong to the configurable product, not its children products. Hence, customers cannot know whether children products are still available for sale, or which child product is sold out. These not only leads some confusing but causes inconvenience for customers. Moreover, the price is also a need-to-optimize issue. Currently, the default of Magento will show the lowest price of the associated product, but sometimes a lot of store owners want to display the highest one. Like the above picture, that is the lowest price of children product, so how are other different price children product displayed? How could customers know about the price of each child product? The only answer is no, they couldn’t, because the default does not support. If customers visit your product page, they see that special price, obviously they cannot know exactly which child product is discounted, or they may misunderstand that all children product would have this special price. Of course, as an online store owner, you don’t want to let it happen. Finally, the default of configurable product in Magento 2 does not support automatic subtotal. It only sums up after adding products to cart and then checking it out in the shopping cart. This issue needs to be optimized because customers need to have an overall view of their order and price to make a buying decision. With the default configuration, they have to check total in the shopping cart after adding items. Now let’s image when they want to continue shopping, they have to come back to the product page to choose items again, is that very annoying and lost time, right? Therefore, as we discussed, these drawbacks of default configurable product in Magento 2 cause customers to inconvenience in the order process. So we recommend using the Configurable Product Grid Table View for Magento 2 extension to optimize the display of configurable products. The extension provides a grid table view, which will be a better idea for the configurable product instead of the selecting option display. With the professional table including all associated products, customers can easily both add all children products to cart at once and follow the availability of products when stock status and some stock can be configured in the backend. As we have said above about price, a need-to-optimize issue, Configurable Product Grid Table View completely satisfy these online store owners by supporting showing unit price and price range. – Display price range for the configurable products. This range is determined by the lowest and highest one among prices of children products. – The unit price of children products will be shown in the grid table. Besides, admin can choose to show only when children products have different prices. Furthermore, the extension supports to display special price for each child product in the table. Total amount problem will be solved at ease with automatically calculate the entire amount feature when selecting quantities of products in the table. Additionally, the extension can show the total amount and price in details at the bottom of the grid table, so customers easily overall review their order. Therefore, using the Configurable Product Grid Table View for Magento 2 extension will provide a better professional display for the configurable product in Magento 2 and bring more benefits for sale. Do you find this article useful? Please Like, Share and Subscribe to update other upcoming blogs. In case you have any further question regarding this blog, Website Development or our extension store on Magento 1 and Magento 2, please feel free to contact us. Our support team is always willing to aid you with the best service of FREE installation, FREE update, FREE 1-year support and 30-day money back guarantee.